It seems that in 1855 the President of the United States asked to purchase and colonize a large extension of Indian territory in the Northwest. 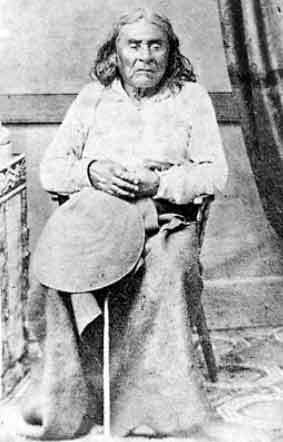 It also seems that Chief Seattle (~ 1778-1866) of the Suquamish tribe replied to him with a letter: there are several different versions of it, probably not authentic, but rich in meaning. Anyway it is a great example of Love for Life. If he could still do it, Chief Seattle today would write the same passionate words to the current President of the United States of America. “The President in Washington sends word that he wishes to buy our land. But how can you buy or sell the sky? The land? The idea is strange to us. If we do not own the freshness of the air and the sparkle of the water, how can you sell them? Every part of this earth is sacred to my people. Every shining pine needle, every humming insect. All are holy in the memory and experience of my people. We know the sap which courses through the trees as we know the blood that courses through our veins. We are part of the earth and it is part of us. The perfumed flowers are our sisters. The bear, the deer, the great eagle, these are our brothers. The rocky crests, the juices in the meadow, the body heat of a pony, and man, all belong to the same family. 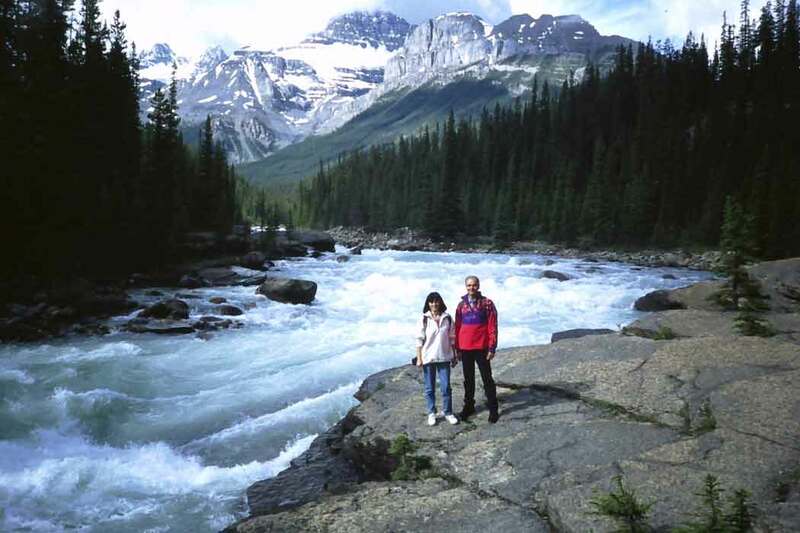 The shining water that moves in the streams and rivers is not just water, but the blood of our ancestors. If we sell you our land, you must remember that it is sacred. Each ghostly reflection in the clear waters of the lakes tells of events and memories in the life of my people. The waters murmur in the voice of my father’s father. The rivers are our brothers. They quench our thirst. They carry our canoes and feed our children. So you must give to the river the kindness you would give any brother. If we sell you our land, remember that the air is precious to us, that the air shares its spirit with all the life it supports. The wind that gave our grandfather his first breath also receives his last sigh. The wind also gives our children the spirit of life. So if we sell you our land, you must keep it apart and sacred, as a place where man can go to taste the wind that is sweetened by the meadow Flowers. This we know: The earth does not belong to man, man belongs to the earth. All things are connected like the blood that unites us all. Man did not weave the web of life; he is merely a strand of it. Whatever he does to the web, he does to himself. One thing we know: Our God is your God. The earth is precious to him and to harm the earth is to heap contempt on its Creator. Your destiny is a mystery to us. What will happen when the buffalo are all slaughtered? The wild horses tamed? What will happen when the secret corners of the forest are heavy with the scent of many men and the view of the ripe hills is blotted by talking wires? Where will the thicket be? Gone! Where will the eagle be? Gone! And what is it to say goodbye to the swift pony and the hunt? The end of living and the beginning of survival. When the last red man has vanished with his wilderness and his memory is only the shadow of a cloud moving across the prairie, will these shores and forests still be here? Will there be any of the spirit of my people left? We love this earth as a newborn loves its mother’s heartbeat. So if we sell you our land, love it as we have loved it. Care for it as we have cared for it. Hold in your mind the memory of the land as it is when you receive it. Preserve the land for all children and love it, as God loves us all. The International Museum of Tarot sought to publish an ancient Italian deck that was as yet unpublished in the modern era. Something not too far from the model that gave rise to the 18th century iconic illustrations of the so-called Tarot of Marseilles; well-known to enthusiasts, (and consequently to a large degree influential over decks published during subsequent centuries). The original card size was 105 x 43 mm. (4.1” x 1.7”) and the Trumps were printed unnumbered although became numbered by hand afterwards. 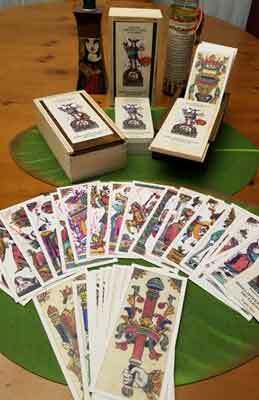 At the time of production, being a Bolognese style deck meant it would be reduced from the traditional Tarot deck of seventy-eight to sixty-two cards; eliminating the Minor Arcana numbered: 2, 3, 4 and 5 of each suit, (following the custom in vogue in Bologna since at least the mid-16th century). Of the original sixty-two, only six cards remain lost to time: 6, 7, 8 & 9 of Swords, the Queen of Cups and Queen of Coins. It is a similar deck to modern successors, such as the Tarocchino Bolognese, but at the same time has many resemblances to its ancestors of the 16th century (with the notable exception of the Devil card); at least with regards to the twelve surviving images of Trumps on two incomplete sheets from the last decade of the 15th century. The first is in the Bibliotheque de l’Ecole Nationale Superieure des Beaux-Arts, Masson Collection, (uncataloged), Paris. The second is in the Musée du Louvre, Rothschild Collection, LR 3804, Paris. In this early Tarot deck there are still traditional depictions of the High Priestess, Empress, Emperor and Pope, that were viewed unfavorably by authorities of the Papal States, and which were subsequently replaced in Tarocchino Bolognese; first by two Popes and two Emperors (by at least 1669) and eventually by images of the four “Moors” during the late 17th century. From the perspective of symbolism, this deck shows extremely interesting details, particularly when compared to the traditional portrayal of the cards. The High Priestess and Pope are the most remarkable cards of the Major Arcana. The High Priestess holds Keys and makes a blessing with a Latin gesture, while the Pope has a closed book and holds a cross. The latter also reveals stigmata on his hands, and has a youthful, beardless face that is decidedly feminine. The details of his Papal Tiara (a triple crown without button or cross) suggest a hypothetical design dating between 1342 and 1503. All face cards of the Major Arcana are interesting from a historic and symbolic point of view, while the Court Cards consistently reflect complementary qualities of courtly pairing in an aesthetically pleasing manner. The distinction between male suits (Wands and Swords) and female (Cups and Coins) is all too evident with the obvious presence of two female chambermaids. However, in this regard, there are many other significant details, such as the postures of these characters, their attire, attributes and ageless appearance. On the back of the cards are two winged angels. One is the classic Cupid with bow and arrow, while the other points to a large tree with a heart hanging like fruit. This is probably a reference to the myth of Apollo and Daphne; both struck by arrows of Eros, but with opposite results. Apollo fell in love with Daphne, while she flatly refused his advances after a long chase through the woods. So as not to give into the passions of the ‘God of Oracles’, this nymph, prayed for an escape and was thus transformed into the sweetly scented laurel plant, (Ovid, Metamorphoses, I, 452-567) known as “Daphne” in Greek and which consequently became the symbolic tribute to great poets in Ancient Greece. 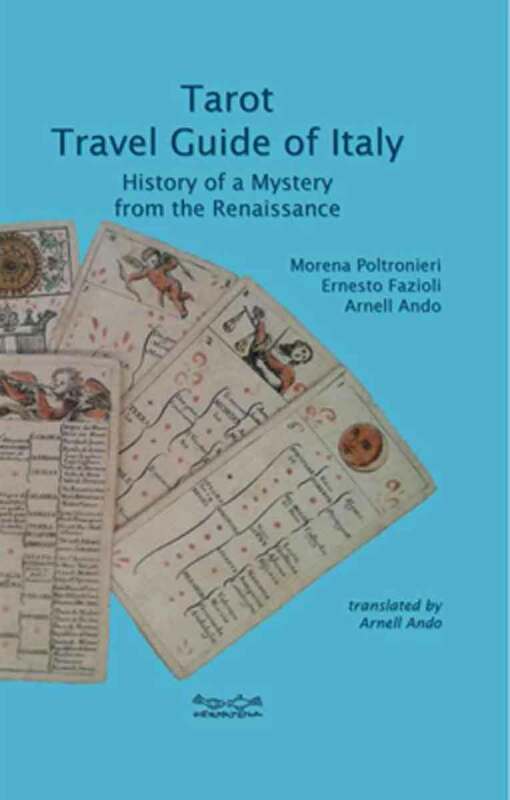 In April 2014 Morena Poltronieri and Ernesto Fazioli (of the International Museum of Tarot) began the challenge of returning this precious Bolognese Tarot of the 17th century back to production. The original fifty-six cards of the Bibliothèque Nationale in Paris are engraved on wood with a colorful façade. Poltronieri and Fazioli did not perform an actual restorative process directly on these cards, but rather worked on the images digitally, through various color definition phases, both with pastels and by utilizing computer graphics. The first step was to print the image in A4 format and then define the contours and colors using professional pastels. The refined images were then scanned and set in Photoshop to clean up smudges caused by time and wear. One of the goals was to not interfere creatively with the look of these cards, but to preserve the original freshness, which is characteristic of the era, and a valuable and distinctive artwork. The end result is respectful of the unique designs, contours and colors, while adding a greater definition to the innate beauty and appearance inherent in the original imagery. The missing Queens (Cups and Coins) have been redesigned and processed through Photoshop, while referring to the Court Cards of an 18th century, double sided, Tarocchino Bolognese, which is part of the permanent collection of the Tarot Museum. For us the fruit of the labor will be in sharing the revival of one of the most important Italian Tarot works of the distant past. After nearly four centuries, this quintessential 17th century deck is again available. This text was written by Giovanni Pelosini and translated by Arnell Ando. travels, to evoke in ourselves ancient memories. in our body vibrates in tune with the places visited. emotional, evocative, esoteric, evolutionary and educational. to attain a higher consciousness, beyond the limits of matter and mind. it all. Like any travel, it is an adventure that never ceases to amaze, and a quest that never ends. consciously functioning, open-air museum that is Italy. their knowledge of the themes, events and places is unique, and their humanity heartfelt. The “Appropriate Tarots” were presented in Bologna (Italy) and Lodovico Frati, in a manuscript of 1668, wrote about this particular system of reading. 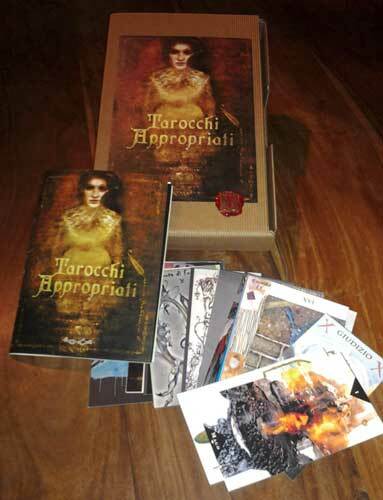 ‘The Trumps of Appropriate tarocchini’, were composed of two different parts: the first part listing the correspondence between the Trumps and the ladies of the past, and the second supplies in prose an explanation of the proposed correspondence. From this ancient system of reading was born the project “Appropriate Tarot.” Like in the past, the 22 Major Arcana inspire poetry – one poem for each card. We are invited, along with this select group of artists to revisit an ancient era in Bologna, when a group of refined ladies would gather together to play parlor games (often ‘tongue’ in cheek’) with hand-painted Tarocchi cards, in order to test wits and lyrical skills with insight or parody on public figures & social commentary, as relating to each Trump card.